The Best Homemade French Fries. Ever. As I’ve progressed along in my read food journey, I’ve noticed that my taste buds have changed. I’ve gradually lost my cravings for many of my once-loved processed food favorites, and I’m pleased to report that my palette has happily adjusted to fresh ingredients and flavorful whole foods. There is one “junk food” that I still love just as much as ever. Thankfully, french fries don’t have to be junk food if you make them with the proper ingredients. Wanna know the secret to perfect fries? In fact, that certain fast-food chain referenced above used to cook their fries in beef tallow, until they sadly switched to the icky vegetable oils in 1990. Did you know that, contrary to popular belief, beef tallow is actually a “good” fat? More and more evidence is popping up, showing us that animals fats (like tallow) are actually better for us than modern industrial oil alternatives. Lard is back, baby! Now, I like oven fries too (the kind you stick on a cookie sheet and bake in the oven). BUT. Sometimes only a true-blue fried French fry will do, and that is where these babies come in. Cut the potatoes (peeled or unpeeled– your choice) into sticks or wedges. Keep in mind that the thicker they are, the longer they will take to fry. Place the potato sticks in a bowl and cover with cold water. Allow the potatoes to soak for about an hour. 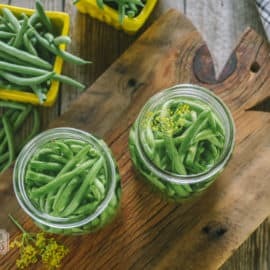 Once you are ready to fry, place the beef tallow in a deep stockpot (enough for there to be 3-4 inches of liquid fat once it melts) and heat it to approximately 350 degrees. Carefully place the potato sticks into the hot oil. Do not fry the entire batch at once– you’ll need to do several, smaller batches for the best result. Once they are finished, remove them from the hot oil and place on a paper-towel lined baking sheet. Generously toss with sea salt and serve immediately. It’s thought that soaking the potatoes in water helps the end result to be crispier. (I think it has something to do with the starch.) I’ve had great results using this method, but it’s not absolutely necessary. If you find yourself short on time, just skip that step. I’m sure a home-fryer like this one would work for this recipe. However since I don’t have one, I’ve found that a deep stockpot works just as well. I also don’t have a frying thermometer, so I just experiment until I find the right temp. I’ll often place one “sacrifice” fry in the oil as it heats up. Once it starts sizzling, I know it’s ready. Be careful not to overload the pot– stick with smaller batches. A crowded pot takes forever to fry, and they are more prone to be soggy. Enjoy your homemade fries with some grassfed burgers (or even some homemade fish sticks) and a generous side of ketchup. Who says healthy food has to be boring? Allow potatoes to soak for about one hour. I use only russet potatoes and soaked them for several hours or over night. Soaking the potatoes removes starches and allows the sugars to come through over the outer surfaces, thus giving colour and crisp to the fries. 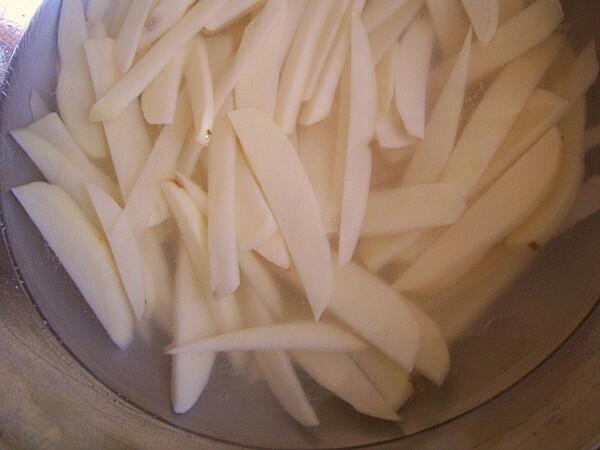 Blanching is a must, remove from water and blanch fries for 3-5 minutes at 300-325. Place them back into a container and into the fridge to cool down completely. Once cool cook to order, sprinkle with pink or course salt. Definitely cook in tallow, either beef or duck. Prep may seem extensive but if you do large quantities at one time you can portion them into servings and freeze for later, I use a “Food Saver” vacuum system. When you want fries, just pull them from the freezer and your good to go! A suggestion for crispier, better tasting, less oily fries: Cook the fries as instructed above for about 2 -3 minutes, then take them out and allow the oil to drain back into your fryer for 5 minutes while keeping the oil at cooking temp. After the 5 min wait, drop the fries back into the oil and finish cooking. 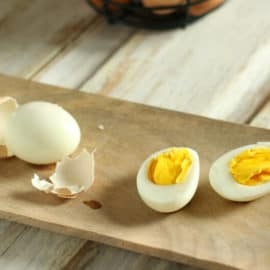 I have heard of the double-frying technique– I think I’ll have to give it a shot! We do the double fry method and love the result! It’s nice to see fries done right! I would like to mention that the way we get good crispy fries is to fry them for about 5 minutes, remove and drain and then when they have all gone through once, re-fry them for another 5 mins and they will be nice and crispy on the outside and soft and grainy in the inside. They can also be frozen after the initial frying, that’s how it’s done commercially, just not with good fat. Thanks again, it’s a nice post. Ooooh– good idea on the freezing. I hadn’t thought of that! 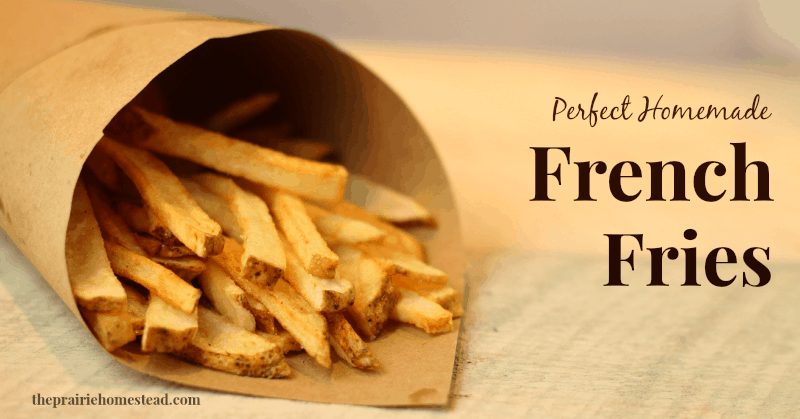 I’ve never used commercial frozen french fries–so if I were to freeze them as you mentioned, would I bake them or re-deep fry them when I’m ready to use them? Dottie, store bought grass fed is cost prohibitive but if you can cow share with friends and family, I’m putting my half cow in the freezer every year for $5.10-$5.25 per lb. We split that cow between 4 households. Only must have, labeling by your butcher needs to have weight on each package. These look amazing! I usually bake our fries, but I think I need to try this sometime with the lard we have. I’ve never tried soaking the potatoes but heard about that recently. Worth a shot! I’m sure the family won’t mind being guinea pigs. Might try the refrying technique, too. Looks like a popular suggestion! If this is in a pot/pan you use often, what do you do with the lard/oil that you’ve just soiled with potatoes? That’s my big problem. I don’t want to waste the oil but not sure what to do with the used stuff. Good question Allison- I meant to mention this in my post. I will pour my “used” tallow back into a jar while it’s still warm and re-use it next time. How many times can a person re-use the oil for deep frying? Those look absolutely DELICIOUS! Wow! Thank you for sharing how you do this. I don’t know how to make homemade fries… that actually taste as good as the ones you eat out. These look so good! And they remind me about the lard I’ve been planning to render…must get on that! The big yellow arches used to fry their french fries in beef tallow. They stopped in 1983. Their fries used to be out of this world until then. They took the bad advice to stop using animal fat because IT WAS UNHEALTHY> Boy people sure did fall for that lie. Animal fat can be “washed” when it gets dirty from cooking. Add water and boil, allow to cool. Clean tallow/lard hardens on the top. Scrap off dirty underside and discard. Good tip Edith– thanks for sharing! Awesome idea! And obvious now that you mention it 🙂 Lol. I had been told that if you plan on saving any oil/fat/grease then pour it through a filter (many layers of cheesecloth or a coffee filter) to remove food particles, which can go bad causing bacteria growth and the oil to go rancid faster. Also, we always refrigerate used oil/fat/grease as an extra precaution. When I was growing up my mom said you could ‘clean’ the oil by frying a potato to remove residual flavors left by other foods. So other than the solids that might collect, there shouldn’t be any problem using the fat again after frying potatoes. Just to let you know that while fries like these do not keep well, if you DO have leftovers put them in a frittata with ham and a good cheese, and they will make that spanish dish a wonderful thing. Keep it organic. If you want some pointers I will be happy to tell you how I do this. Awesome direction and I’m going to try and make some fries tonight! Thanks and was awesome! Really the best fries I’ve had in a long time and also easy to make. Good post. 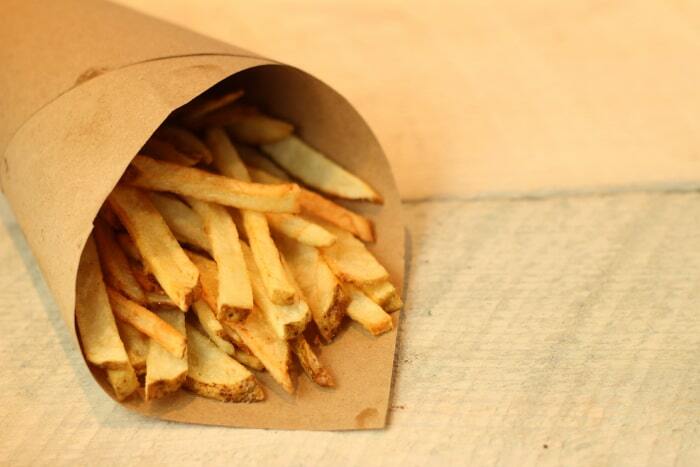 Homemade French fries may not be considered junk food. Thanks for the post. Just came across this web site. There is a difference between cultures here. Born in London, England, I now reside between Toronto and Bangkok. We have chips, not the thin crispy things in bags for snacks, which are slightly different from your French fries, which are much thinner. French fries and chips can be cooked only once and that is traditional. At fish and chip shops, traditionally, beef fat, known as :suet” was used. Now, regretfully many now use “other” stuff. As an ex-chef, may I say comments and suggestions are generally good. I, though. still make many goodies from suet, such as cakes, puddings, pies, etc. It has a higher melting point than most other products and produces great food. (I never use lard due to personal preference and beliefs.) Why am I giving so much information? 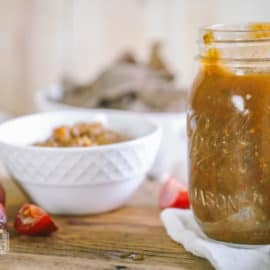 Well, I have attached a recipe that is even better than the one(s) suggested. Give it a try, although it does take longer that the usual “fast” style developed in your country and now around the world. Thanks for reading and hopefully trying. 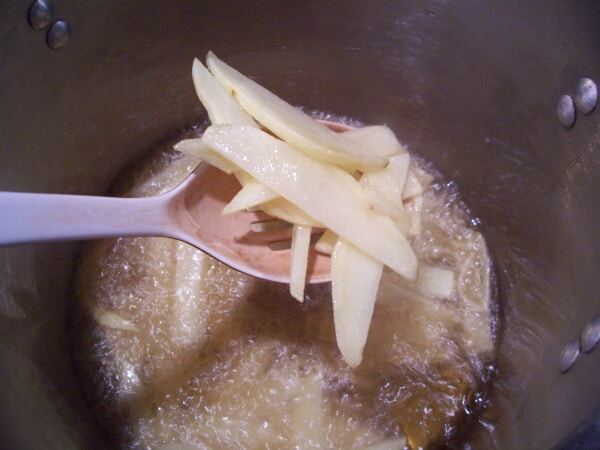 Heat the oil in the deep-fat fryer or deep pan to 180C/356F and fry the chips until golden. Drain, sprinkle with salt and serve. That can work, if you have enough of it. if you reuse tallow to frying is’nt the tallow color will turn into black or dark? Tallow/lard, or any oil will become black, or at least very dark, when it is used too much (it is picking up bits of the food being fried and that food is burned after reuse), or is burned. When it turns color, it’s done, and needs to be replaced. Also beware of using lard or any oil that has been stored for long periods that has been used. It will become rancid, and shouldn’t be used for food. Ok, I’ll admit my husband spoils me and makes the best homemade fries. I like them crunchy so he double fries them. This is a treat and doesn’t happen very often but when it does, they are amazingly delicious. Hi Charlene, I’m Belgium, where the best fries are maked in the world, but the are called french fries:your husband do it on the right way:) you must always do a double fries first time on a lower heat 160°C 4 min.then takes them out the pot,do so with all the fries ( when all done for the first backing, let them wait and set heat higher 180°C for the second fries, they only need a 2 or 3 min backing time, and also it takes less time to bring all the fries on the table.the are very crunchy that way and soft inside. Gee. I have never asked for the tallow when we have a cow processed. What exactly is tallow? Is it the fat trimmed off the outside? Or is it kidney, heart fat? Is that also called “leaf fat”? We normally slaughter a lame cow, rather than send to auction. 2-8 years old. Not sure if older cow fat will taste good? THANKS. Nice recipe. I don’t use coconut oil because I’m allergic. Never thought about using lard. Will have to try it. What would you use instead of sea salt can’t use that because hubby is allergic? It is so funny to read this particular blog in light of what I know, as a former Owner/Operator of that particular National chain, which is: All the yellowish arches fries were made with lard, and only lard, until the Food Police made it impossible for them to continue to do business using that incredible, natural, best-pastry-ingredient-ever fat. They were literally bullied into changing to that soy mix oil, forever ruining the best fries on the planet. That was then; this is now. 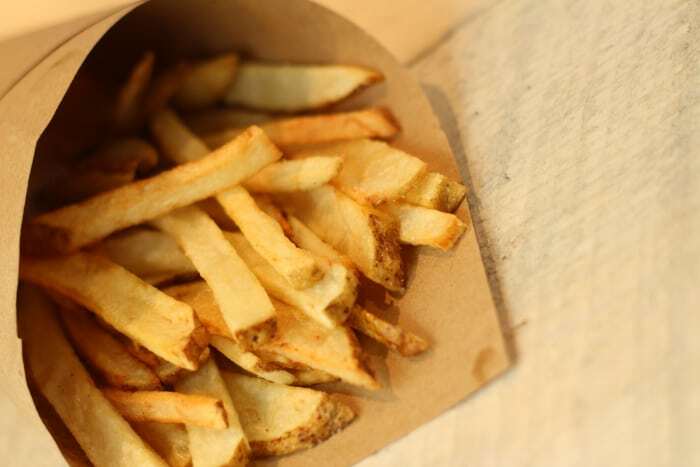 Have you tried just spritzing your fries with EVO oil, then baking them? Sprinkle a little salt on when they come out of the oven. Better yet, choose a favorite seasoning like a steak rub/blend, salt, pepper, onion, garlic (let your imagination go wild) sprinkling liberally after spritzing with olive oil, then baking them? 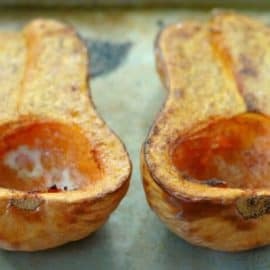 (400 degrees, 20 minutes for sweet potatoes, turning half way through baking time) This works wonderfully, too, for sweet potato fries, for those of you who are unable to eat regular potatoes and who haven’t access to a deep fat fryer, or don’t want the added heavy fat. Oh, by the way? The real secret to those Golden… fries is that they are parboiled before flash freezing them for shipping. In the old days they were cut up at the store, parboiled, drained, and dropped in the hot lard just before serving to a very happy clientele. Super yummy! If I’d read through your post, Jill, I’d have realized that you included baking the fries. Great blog. Love reading it. 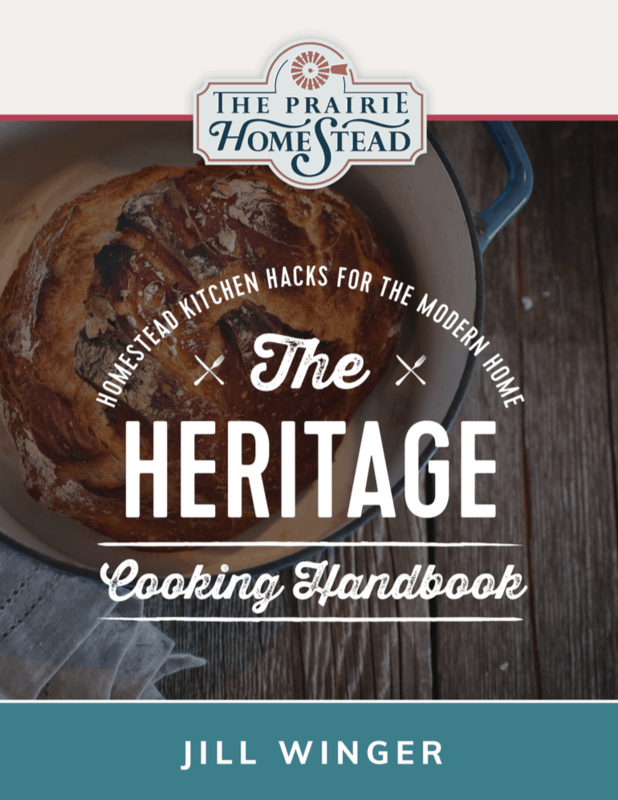 I’m not a homesteader but am always dreaming of doing it. I certainly have acreage but the energy…. ?” I especially enjoyed your time management topic this week from your newsletter. It’s five AM, I’m heading to the kitchen with a 50 lb bag of russets on my shoulder. I dump them into the skinner, a nasty looking machine that grinds the outer surface of the spuds. If you forget what you are doing, you end up with golf balls! One by one, the potatoes go through the french slicer. Nope, don’t wash them, just right into the Fry-o-Lator for 20-30 minutes at 250 to 275 degrees for the pre-fry. The fries are laid out on a hotel sheet, 13 X 19 or so, and bundled into ‘servings.’ From there the fries go into the walk-in cooler. When the lunch hour rush hits, the sheet comes out and the cook tosses a serving into the Fry-o-Lator, now at 375 degrees, for less than five minutes to give the fries that perfect brown effect. We called it “double down,” but it’s similar to twice cooking. We are also talking the mid 60s, so the technique is not new. Were the fries good? None better!